Good news today for fans of colorful, creative and crazy games. Drinkbox Studios, known for developing a variety of games for multiple consoles, has announced something called the Drinkbox Vita Collection. This digital bag of goodies comes out this week, Wednesday July 13th, and will feature all 3 of Drinkbox’s great Vita games in one convenient bundle! First up is Tales From Space: Mutant Blobs Attack, which was apparently a Vita launch title (you can tell I’m a new Vita owner). In it you take control of an escaped blob creature and help him run amok and get revenge on humanity. 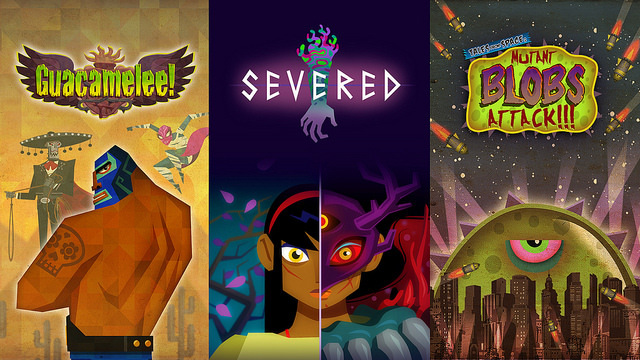 Second is the fantastic Guacamelee!, which is a Metroidvania mixed with lucha libre. It’s just as crazy as you might imagine, and loads of fun, plus it’s cross-buy for PS3. Last but not least is recently released dungeon crawler Severed, where you make use of the touch screen functionality to battle foes and make your way through harrowing enemy lairs. Honestly, all of these games are worth owning, so if you don’t own any of them yet, you owe it to yourselves to check this out on Wednesday.